The first section, Cognitive Skills: Understanding Learning Challenges will focus on the skills involved in learning and introduce you to various techniques and strategies on identifying a child with learning difficulties and to overcome their challenges. It also provides tips on how to make learning fun, challenging and different. Wow! Fantastic information-- looking forward to utilizing these strategies in my classroom! Shannon H.
Great class! It was a nice refresher course! I learned the material ages ago and it was nice to review. Hope B.
I really enjoyed taking this course Accommodating all Learners. I learned so many new strategies to use with my students. Thank you. Very user friendly, time manageable, easy to navigate. Good course with helpful links. I liked being able to download helpful links for future use. More frequent checking for understanding or quizzes. I see I have to spend 5 hours discussing/practicing, but I'm a substitute teacher, so I don't really have colleagues to discuss with. Apart from peer discussion boards, which you don't have, I have no way to attain these five hours. While some of the modules were very comprehensive and through in explaining (lesson 5,6), other modules seemed to have lots of information that didn't have a clear connection to the other content and was so general that it wasn't useful (lesson 1,3). However, the interactive features and articles/links were very interesting and useful. There was so much new information in this course. I really enjoyed this course. The material was put together in a new way for me and I learned alot. I liked the interactive feature. I thought this course was very applicative towards my line of work. I liked my 1st course. Thank you for this convenient opportunity. I am thankful you can take the classes on line. I truly enjoyed the course. I enjoyed the course work, it kept me thinking beyond the five hours. I had to review many of my previous concepts and theories. Thanks. Course just what was necessary for me! I really appreciated the links to research articles and resources that I can reference. This course is extremely informative. I am looking forward to my next course on ADD. This was very informative. I look forward to using this information with my students. It was rich in content and I seriously enjoyed this coarse! Thank you! Nice job; quality was better than expected. Learned a lot for this course. Very informative and applicable to daily teaching. Very good personal inventory and printable materials for use now and later. thank you. First course in a relicensure program. I'm very happy with the flexibility the format offers as well as the content in the lesson. This option makes it possible to conveniently accrue needed pd credits when needed. The content was really strong, it was a much better training than I had anticipated. Even though I have been exposed to these topics and concepts previously, it reminded me of things I had forgotten and deepened my knowledge about these things, in addition to giving me new tools to use and making me think about ways I could apply it to improve my teaching and learning practice. 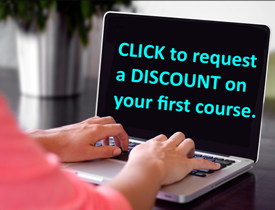 The format of this online course was very easy to use. Great course, nice review, with updated research included. Thanks for making this so accessible and technologically easy! Of all of the classes I have taken thus far, I feel that "Cognitive Skills" was the one that presented me with the most new information I had not learned up to this point. While some of it was review, much of it was brand new to me and I loved learning about all of the different learning styles. "I really enjoyed how this online class offered so many different ideas to use in your classroom. The experiments were really fun!" This was my first attempt at on an on-line course in a very long time. I enjoyed the lessons and activities. thank you. Getting tech support was quick and easy. It was a good course. Lots of information I knew but needed to review and update myself on. This course was very content rich. To have this information compiled in course was fantastic. Great course. Course was good. A little slow to start. For me, the most interesting portions of the course were the parts that were not required, like the PLSI (completing it) and the excellent article by Mark Prensky. I really liked the case study at the end; it gave me an opportunity to observe synthesis of the ideas presented. It made me think about my own students more so than the other exercises. Very convenient program. Thank you!